Three to five days after symptoms begin, a rash breaks out. It usually begins as flat red spots that appear on the face at the hairline and spreads downward to the neck, trunk, arms, legs, and feet. Small raised bumps may also appear on top of the flat red spots. The spots may become joined together as they spread from the head to the rest of the body. When the rash appears, a person’s fever may spike to more than 104° Fahrenheit. How is the Measles transmitted? Measles is a highly contagious virus that lives in the nose and throat mucus of an infected person. It can spread to others through coughing and sneezing. Also, Measles virus can live for up to two hours on a surface or in an airspace where the infected person coughed or sneezed. If other people breathe the contaminated air or touch the infected surface, then touch their eyes, nose, or mouth, they can become infected. Measles is so contagious that if one person has it, 90% of the people close to that person who are not immune will also become infected. 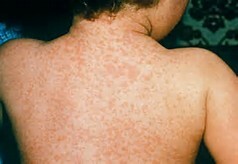 Infected people can spread Measles to others from four days before, to four days after the rash appears. Measles is a disease of humans--Measles virus is not spread by any other animal species. 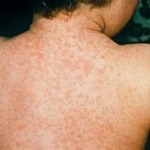 What are the complications associated with the Measles? Measles can be serious in all age groups. However, children younger than 5 years of age and adults older than 20 years of age are more likely to suffer from Measles complications. About one child out of every 1,000 who get Measles will develop encephalitis (swelling of the brain) that can lead to convulsions, and can leave the child deaf or mentally retarded. What are my choices for getting the Measles vaccine? What are the ingredients in the vaccines? Who should not get the vaccines? MMR (Measles, Mumps, and Rubella ) vaccine. Some people should not get MMR vaccine or should wait. 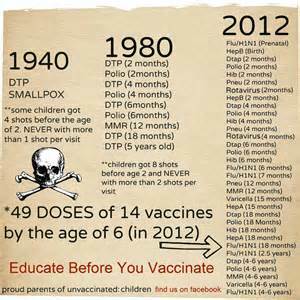 *****Any of these might be a reason to not get the vaccine, or delay vaccination until later. Have ever had a life-threatening allergic reaction to a previous dose of MMRV vaccine, or to either MMR or varicella vaccine. Have ever had a life-threatening allergic reaction to any component of the vaccine, including gelatin or the antibiotic neomycin. Tell the doctor if your child has any severe allergies. Have HIV/AIDS, or another disease that affects the immune system. Has a history of seizures, or has a parent, brother or sister with a history of seizures. Has a parent, brother or sister with a history of immune system problems. Has ever had a low platelet count, or another blood disorder. Recently had a transfusion or received other blood products. 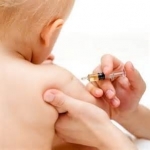 Children who are moderately or severely ill at the time the shot is scheduled should usually wait until they recover before getting MMRV vaccine. Children who are only mildly ill may usually get the vaccine. If my child's immune system is underdeveloped until the age of 2, is it beneficial for the live viruses to be injected at such an early age? If I have a history of auto-immune disorders in my family, should I be concerned? What is considered a mild illness? If the MMR vaccine is 97% effective after the 2nd dose, why are people who have been vaccinated still contracting the measles? If Measles is a virus, can it mutate and change once someone is infected (like the flu vaccine)? When was the last time the formulas for the MMR and/or the MMRV were changed (the dates for the ingredients from the CDC website are from 2010/2011)? For more questions to consider about vaccines in general, click here. It doesn't matter to me which side of the fence you are on when it comes to vaccines. However, I do think we need to know more about what we are putting in our children's bodies. With 1 in 6 having a developmental disability and 50% of children with chronic illness, we need to ask the questions and demand answers. 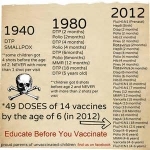 The vaccine schedule has more than tripled since the 1980's. If vaccines are not contributing to the rise in childhood diseases and disorders, what is?